Before we get into the business of grading USC’s 2019 signing class, it’s important to lay out something of a rubric. First and foremost, this isn’t a referendum on how this class will ultimately turn out. Neither I, nor anyone else, can claim to know how 26 unique players, with unique skill sets and backstories, will fare five years from now. Even if we did, that doesn’t mean we were right, per se: There are so many variables that factor into a player’s success that, sometimes, luck plays more of a role than anyone wants to admit. There’s a reason why NFL teams fail at this every single year. Scouting is hard. In reality, then, exercises like this are really about grading the school, not the players. What I’m attempting to do here is examine USC’s process for how it recruited the 2019 class relative to the outcome of who they ended up signing – because, as I’ve harped on before in other contexts, so much of why USC is in the position its in has to do with bad processes. Your mileage with this class will vary depending on how much you believe in a host of under-the-radar types developing into gems – but, in USC’s case, a good number of those players only came on board after they missed on other, higher-profile targets. That certainly doesn’t preclude these players from succeeding or even outperforming those Plan A targets. But it does mean that USC should only get so much credit if they ultimately blossom, because if the Trojans had things their way, a number of them wouldn’t be on the roster in the first place. That matters a whole lot when it comes to early grading. Context also matters. No signing class exists in a vacuum, not for the schools and certainly not for the players. Every quarterback, for instance, is well aware of who is ahead of them on the depth chart at the schools they’re considering, which makes it unreasonable to expect USC, who signed a blue-chipper in 2018 and has a blue-chipper committed in 2020, to land a similar elite talent. Situations like those are also reflected in the grading. So does supply and demand. Right now, the majority of USC’s talent comes from within its home region – California, obviously, but also states like Hawaii, Utah, Arizona, Oregon, Nevada and Washington. That’s to be expected when the on-field results no longer match those of a consistent national power. The trickle-down effect is that the Trojans are often at the mercy of what’s available in their backyard when it comes to elite talent. In 2019, it was always going to be hard for them to sign a big-time safety class, for instance, when it was a pretty weak class out west. Conversely, a great cornerback haul was very much a possibility given the amount of talent California had in-state. That’s unlikely to change in the bigger picture until the team starts winning again. All of that affects the grade. Finally, sheer numbers. This one is pretty obvious: It’s hard to make a great meal if you don’t buy enough ingredients. USC went light in a couple key areas and that will be factored in, too. With all of that said, let’s conclude on defense, the side of the ball that dramatically improved in between the two signing periods. Try TrojanInsider.com Premium for only $1.00! USC only graduated Malik Dorton from last year’s group, so the Trojans were playing with house money as far as how many defensive linemen they ultimately wanted to sign. 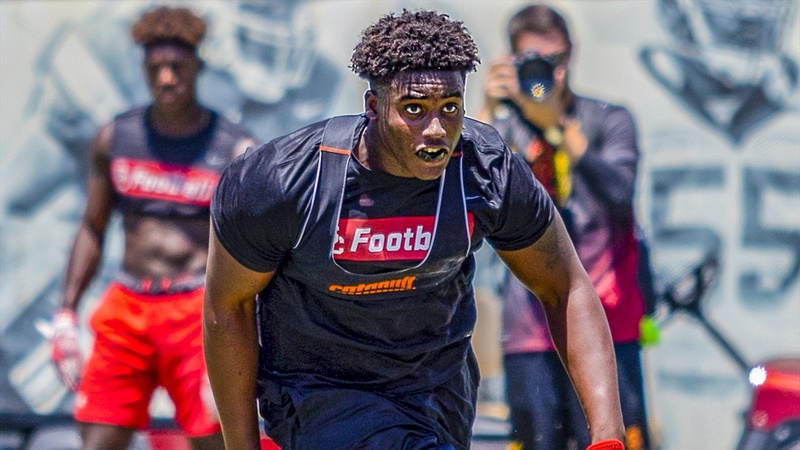 Whether it was one, two, or as many as three players, the only real requirement was that they add a high school defensive end after not taking one in 2018. To that end, it was mission accomplished as soon as Drake Jackson inked his letter of intent in December. No commitment was more of a nail-biter, not only for its last-minute nature but also for the fact that he was the only big fish left in the pond after prime targets Faatui Tuitele, Stephon Wright and Ty Robinson all signed elsewhere. Don’t be surprised if he winds up as the best of that quartet when it’s all said and done, either. He’s easily one of the best prospects in USC’s class. Like cornerback, USC had to scramble to cull a safety class and it wouldn’t be unreasonable to describe all four as backup plans. The crucial difference, though, is that the available pool out West was far shallower. The Trojans spent most of the cycle chasing – and twice missing out on – Cam Williams, while they shot themselves in the foot a bit with how up and down they were recruiting Pola-Gates. After that, though, there wasn’t much else in the elite bracket besides Chris Adimora, who was set on leaving California. Considering that, I think USC did quite well with the four players they signed, each of whom has very intriguing aspects to their game. Allen, the early signee, played at one of the top programs in the country (IMG Academy), really flashes on film and, like Otey, has a lot of name schools on his offer sheet. Hewett emerged late but should immediately become one of the fastest players on the roster and started for North Shore, a perennial powerhouse in Houston who won this year’s state title. Maukala has an ultra-projectible frame and tore up the Poly Bowl. Williams would have had most of the Pac-12 recruiting him had his academics been in order earlier in the season, and still ended the year with all of USC, Washington and Oregon hot after his services. There’s a lot to like with those four and sheer odds dictate that at least one or two will turn into quality players. Not all fallback plans are created equal and I’m optimistic that, in four years’ time, this unit as a whole will make Greg Burns and co. look very good.